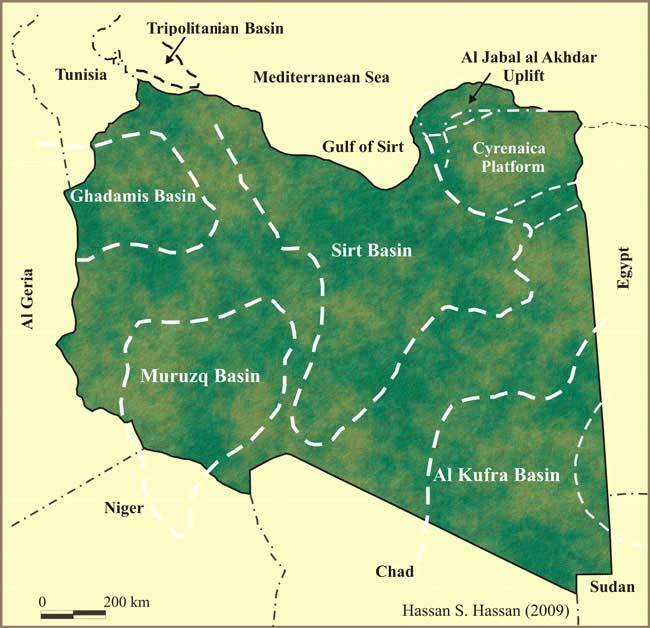 The intraCratonic Ghadamis Basin encompasses a portion of western Libya, southern Tunisia and eastern Algeria. It covers about 390,000 km2 with the depocenter of the basin situated on Algerian side. A maximum thickness of about 7000 m of Paleozoic sedimentary rocks is reached in Algeria. The typical basin fill is comprised of mixed clastic and carbonate rocks. The Ghadamis Basin is a prolific hydrocarbon province, with total recoverable oil discovered to date in excess of 3.5 billion bbl. 950 MMBOE is currently under production in the Libyan portion of the basin. Geochemical studies have been made by Ferjaoui and others (2001) which indicates that oil and gas discovered in the Ghadamis Basin were sourced by two major rock units: the Middle-Upper Devonian and Basal Silurian hot shales. During the Late Silurian and Lower Devonian several Transgression/Regression cycles caused continental deposition over much of the area which was followed by marine deposition through to Carboniferous times (Moffat and Johns, 2001). Sea level changes produced the major reservoirs of the Ghadamis Basin in the Upper Silurian (Acacus Formation) and Lower Devonian (Tadrart Formation). Continental sand accumulated in the Triassic while in the Jurassic and Cretaceous accumualtion of lagoonal Dolomites, evaporites and shales was dominant (Kirmani and Elhaj, 1988). The source rock analysis of the kerogen type for the Ghadamis and Murzuq Basins in the Figure below have revealed low H and O indices for all the SRs. 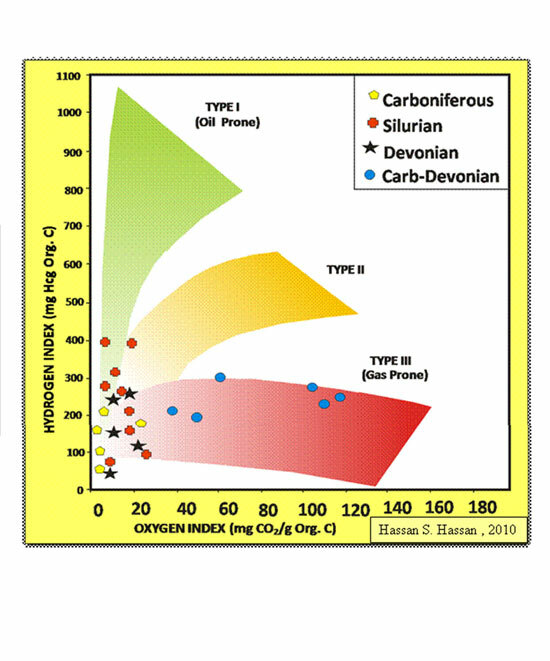 The Van Krevelen plot below (Data from Hamyouni,1984), ) shows results that indicate that the Silurian units contain mainly oil-prone, H-rich type I kerogen derived from algal matter and marine plankton. The kerogen of the Devonian- Carboniferous sections include a dominant component of gas-prone type-III kerogen formed from terrestrial plant material. The other two Devonian and Carboniferous sections have a mixture of oil prone, H-poor type I and II kerogen of marine origin (Hamyouni, 1984). It is interpreted that most of the oil produced in this basin is currently is sourced from the Silurian shale.